A project ALM connection links an SD Elements project with a project in another ALM tool through an existing system connector. Create or update an existing project ALM connection by following the steps below. Is a member of the project’s business unit and has the permission Global Roles→Administration→Edit all projects. Is a member of the project and has the permission Project Roles→Project Management→Sync with ALM tools. Is a member of the project and has the permission Global Roles→Integration→Edit ALM connections. Select a project, then select the Integration tab. The project ALM integrations page appears. To add a connection, click the plus add_circle button on the right. To edit an existing connection, click the connection name. Parent: Select the system integration connection for the ALM tool, such as JIRA or CA Agile Central. If you do not see the appropriate system connector in the Parent list, contact your administrator to request a new system connector. Refer to the ALM tool’s configuration guidance for more details. Click Test Connection at the bottom-left of the dialog. Click Done at the bottom of the page. The connection is ready to sync. To test the configuration of an ALM connection follow the steps below. The user has the permission Project Roles→Integration→Sync with ALM tools. Select a project, then select the tab ALM. In the case of an error, the details will be displayed at the bottom of the connection’s form. 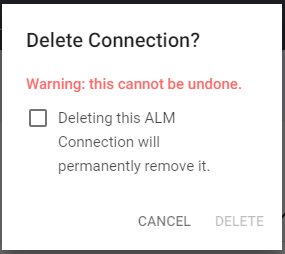 Delete a project ALM connection by following the steps below. The connection is removed from the project and no future sync operations will occur. No changes are made to any issues in the ALM project. After creating a connection between your SD Elements project and an ALM project, SD Elements tasks will synchronize to the ALM project according to your selection. For example, if you selected an automatic synchronization frequency (such as hourly or daily), synchronization will occur at the scheduled time. If you selected manual synchronization, you must click the Sync button on the ALM Integrations page to synchronize the SD Elements tasks with your ALM project. Open the project’s list of ALM connections. Click the connection’s Sync button. The synchronization process is initiated. It may take a few minutes or more, depending on the number of tasks in scope for integration and the latency between SD Elements and the ALM server. During synchronization, SD Elements will attempt to add tasks to the ALM project if they do not already exist. SD Elements will add a note to each synchronized task with a reference to the new item created in the ALM system. Ready: The integration is ready to be run. In progress: The integration is underway. Click the red exclamation mark to view further details. Use Test Connection to troubleshoot further. and any required fields are set for a new ALM issue. Completed: The integration is successful, see the ALM project for SD Elements tasks.